With just 40 days remaining before AWS re:Invent begins, my colleagues and I want to share some tips that will help you to make the most of your time in Las Vegas. As always, our focus is on training and education, mixed in with some after-hours fun and recreation for balance. MGM Grand – Business Apps, Enterprise, Security, Compliance, Identity, Windows. Aria – Analytics & Big Data, Alexa, Container, IoT, AI & Machine Learning, and Serverless. Mirage – Bootcamps, Certifications & Certification Exams. Venetian / Palazzo / Sands Expo Hall – Architecture, AWS Marketplace & Service Catalog, Compute, Content Delivery, Database, DevOps, Mobile, Networking, and Storage. Linq Lot – Alexa Hackathons, Gameday, Jam Sessions, re:Play Party, Speaker Meet & Greets. Encore – Bookable meeting space. 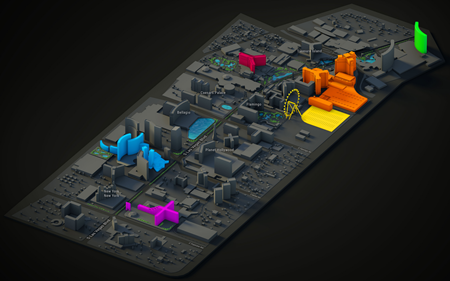 If your interests span more than one topic, plan to take advantage of the re:Invent shuttles that will be making the rounds between the venues. 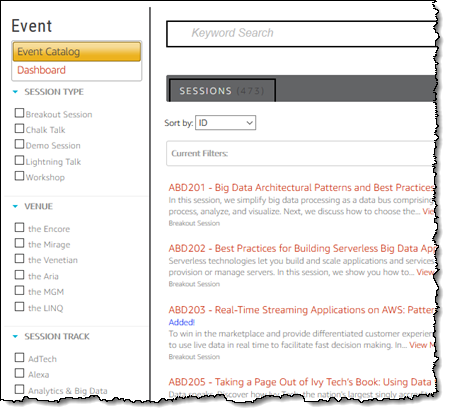 The re:Invent Session Catalog is now live and you should start to choose the sessions of interest to you now. With more than 1100 sessions on the agenda, planning is essential! Some of the most popular “deep dive” sessions will be run more than once and others will be streamed to overflow rooms at other venues. We’ve analyzed a lot of data, run some simulations, and are doing our best to provide you with multiple opportunities to build an action-packed schedule. We’re just about ready to let you reserve seats for your sessions (follow me and/or @awscloud on Twitter for a heads-up). Based on feedback from earlier years, we have fine-tuned our seat reservation model. This year, 75% of the seats for each session will be reserved and the other 25% are for walk-up attendees. We’ll start to admit walk-in attendees 10 minutes before the start of the session. Las Vegas never sleeps and neither should you! This year we have a host of late-night sessions, workshops, chalk talks, and hands-on labs to keep you busy after dark. To learn more about our plans for sessions and content, watch the Get Ready for re:Invent 2017 Content Overview video. After you’ve had enough training and learning for the day, plan to attend the Pub Crawl, the re:Play party, the Tatonka Challenge (two locations this year), our Hands-On LEGO Activities, and the Harley Ride. Stay fit with our 4K Run, Spinning Challenge, Fitness Bootcamps, and Broomball (a longstanding Amazon tradition). As always, I am looking forward to meeting as many AWS users and blog readers as possible. Never hesitate to stop me and to say hello!